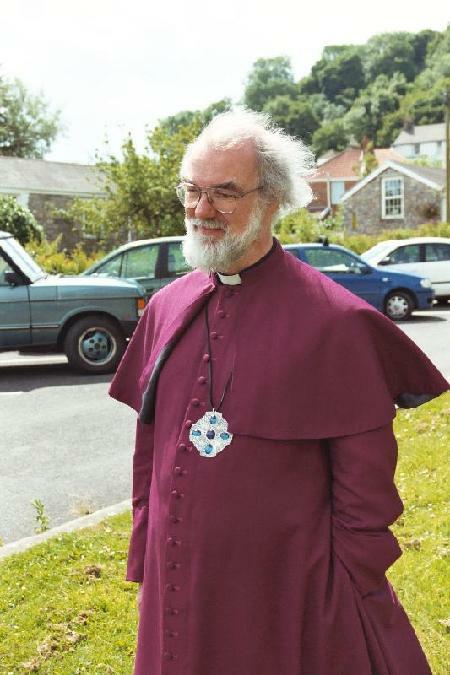 Rowan Williams was born in Swansea, south Wales in 1950, into a Welsh-speaking family. All Saints became his place of worship and where he sang in the choir. He was educated at Dynevor School in Swansea and Christ's College Cambridge where he studied theology. He studied for his doctorate – in the theology of Vladimir Lossky, a leading figure in Russian twentieth-century religious thought – at Wadham College Oxford, taking his DPhil in 1975. After two years as a lecturer at the College of the Resurrection, near Leeds, he was ordained deacon in Ely Cathedral before returning to Cambridge. From 1977, he spent nine years in academic and parish work in Cambridge. 1986 saw a return to Oxford now as Lady Margaret Professor of Divinity and Canon of Christ Church; he was awarded the degree of Doctor of Divinity in 1989, and became a fellow of the British Academy in 1990. He is also an accomplished poet and translator. 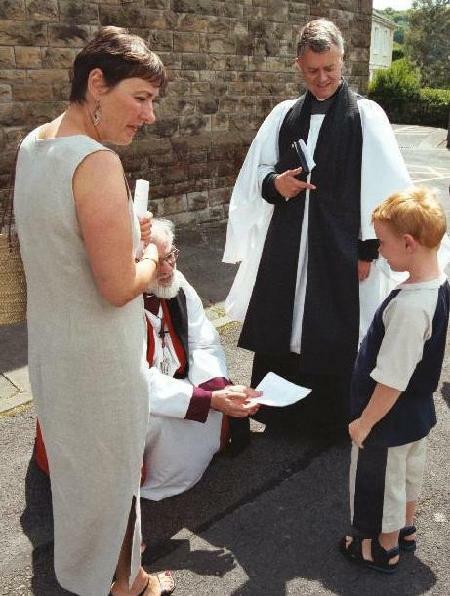 Receiving a Celtic Cross, a gift from the Parish. Judge Stuart Batcup, an old friend, makes the presentation. 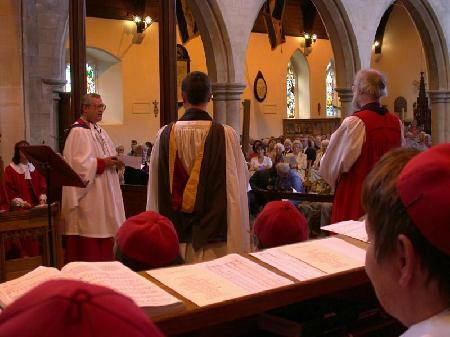 Thus it was that, in July 2002, with eleven years experience as a diocesan bishop and three as a leading primate in the Communion, Archbishop Williams was confirmed on 2 December 2002 as the 104th bishop of the See of Canterbury: the first Welsh successor to St Augustine of Canterbury and the first since the mid-thirteenth century to be appointed from beyond the English Church. 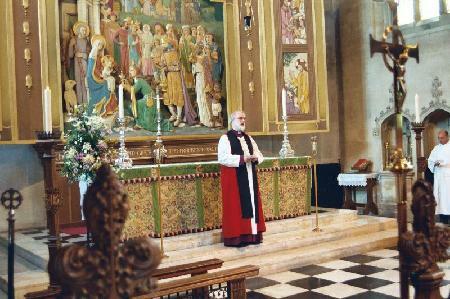 Archbishop Rowan at the High Altar in All Saints. As Archbishop of Canterbury his principal responsibilities were pastoral – leading the life and witness of the Church of England in general and his own diocese in particular by his teaching and oversight, and promoting and guiding the communion of the world-wide Anglican Church by the globally recognized ministry of unity that attaches to the office of bishop of the See of Canterbury. 2013. We are delighted to report that Dr. Rowan Williams, upon his retirement as Archbishop of Canterbury, has been granted a life peerage by HM The Queen. Dr Williams will become Lord Williams of Oystermouth. He now assumes the position of Master of Magdalene College, Cambridge University. Archbishop Rowan meets Adam Evans, Canon Keith and Mary Evans. Thanks to Pastor Wolfram for the photos of Archbishop Rowan at All Saints.